: This native Russian hunting breed is one of the principle hunting dogs of the Taiga region as well as mountain areas in Central and East Siberia. The breed evolved from off-spring of Tungus, Yakut, pre-Baikal and pre-Amur Laikas. 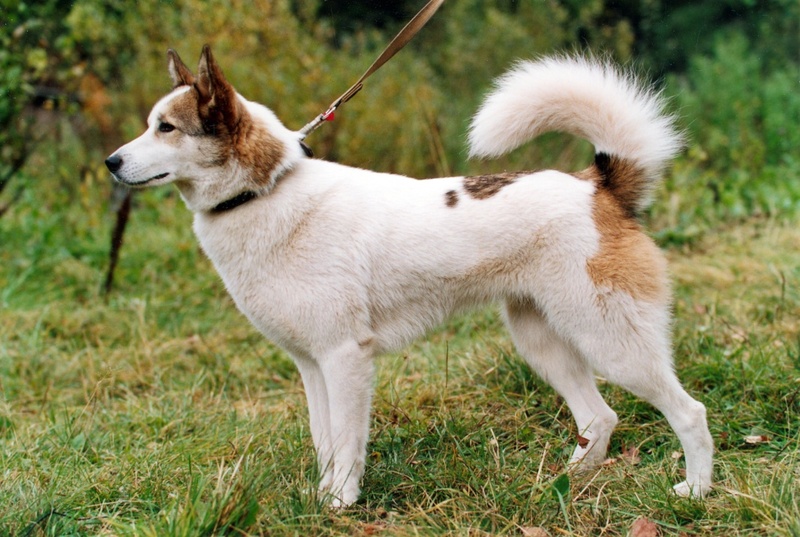 The first description of the pre-Amur Laika, which later become the basis of the breed standard, dates from the beginning of the 20th century. 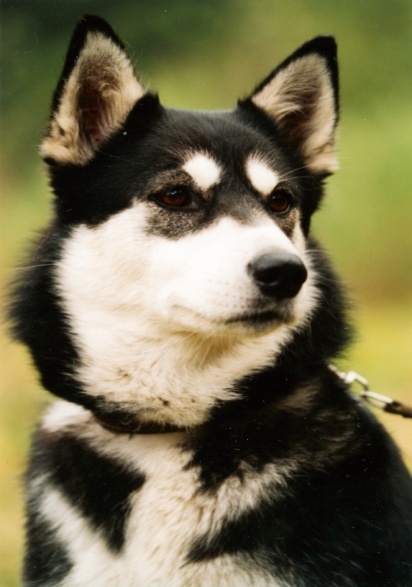 In 1947 East-Siberian Laika achieved breed status. In 1949 the provisional standard was published and in 1981 the final standard for was approved. : Dog of medium size with strong and compact built. The length of the body, from the forechest to the buttocks, is slightly superior to the height at the withers. The head is rather big and very strong. Index of format (height/length) Males 100/104-109. : Steady, balanced temperament. A vigorous dog with a very well developed sense of scent and detection of game and a pronounced passion for hunting, especially larger prey. Very independent when hunting. Friendly, kind and trustful towards people. : Strong, rather big in proportion to the body; wedge-shaped it forms an equilateral triangle when viewed from above. Cranial area is relatively broad, especially in males. : The length of the skull is slightly more than the width. Superciliary arches only slightly developed; saggital crest and occiput are well pronounced. : Gradually and moderately pronounced. : Black of medium size. In white and fawn dogs a brownish nose is tolerated. : Moderately tight, but not pendulous. : Teeth white, large, strong, well developed and evenly positioned. Complete (42 teeth) dental formula; scissor bite. : Cheekbones pronounced but not exaggerated. : Medium sized, oval shaped, slanting, neither deep set, nor protruding, with truthful and friendly expression. The eyes are dark brown or any shade of brown in accordance with coat colour. : Pricked, mobile, V-shaped with pointed or slightly rounded tips. Ears set wide, in line with the eyes. Ear-lobes are developed slightly. Inner part of the ear is well coated. : Muscular, dry, round or slightly oval in cross-section; the length is equal to that of the head or a little bit shorter. The neck is set at approximately 40° - 50° to the horizontal. : Firm and straight, sloping from the withers to the tail-set. : Well developed, pronounced, especially in males, rising above the topline by 1-2 cm; moderately developed in females. : Straight, strong, well-muscled, moderately broad. : Short, moderately broad, well-muscled and slightly prominent. : Broad, slightly sloping, relatively long. : Broad, deep (the chest reaches the point of the elbow or 1-2 cm below, especially in males), long; oval-shaped in lateral (cross) section. : Curled or in sickle shape carried over the back. A sickle shape tail carried without touching the back or semi-dropped is acceptable. When fully straightened it reaches the hock joint or may be 1 to 2 cm shorter. : Legs lean, muscular; viewed from the front are straight, moderately wide set and parallel. The height of the forelegs from the elbow to the ground is equal to half the height at the withers. : Shoulder blades are long, muscular and moderately laid back. : Long, moderately oblique, muscular. The angle between the shoulder blade and the upper arm is well pronounced. : Fitting close to the body; point of the elbows are well developed and placed back parallel to the axis of the body. : Straight, dry, muscular, round in cross-section, viewed from the front moderately wide and parallel. : Not long, slightly inclined when viewed from the side. : Round or slightly oval, arched with tightly knit toes. : Round or slightly oval, arched with tightly knit toes. Hind feet are slightly smaller than forefeet. : Moderately long, placed slightly obliquely. : Long, placed obliquely, not shorter than the upper thighs. : Placed almost vertically. Seen from the side, a perpendicular line, from the buttocks to ground, should fall close to the front of the rear pastern, or slightly further of it. : Free mover. Typical movement is a far-reaching trot, alternating with gallop or walking pace. : Sufficiently thick and elastic; without any folds and subcutaneous cellular tissue. Outer coat is harsh and straight. Undercoat is well developed, soft, rich and woolly. The coat on the head and ears is dense, short and shining. : The most typical colours are black and tan, black, black and white, white and white with patches – piebald. Slight specks in shades of the main colour are permitted on the legs. : Males 57 - 64 cms. Females 53 - 60 cms. Prominent forehead and snipy muzzle. Partly missing pigmentation of the nose, lips, and eyelids. Absence of not more than 4 premolars PM1- PM2. Teeth small and sparsely set. Light or amber coloured eyes in dogs with all black coat colour. Big ears; set low; soft in ear carriage; not enough hair inside ears. Neck too oval in cross section. Long in loin; straight; arched loin. Flat ribbed chest; narrow; lacking forechest; shallow. Straight shoulders, bowed forearms, elbows turned out- or inwards. Up-right or weak in pasterns. East-west pointing feet; pigeon-toed feet. Hindquarters slightly lacking correct angulations; cow hocked. Splayed or soft feet, insufficiently developed hair between the toes. Colour specks in nuances of base colour, on the body or head. Obvious deviation from the sexual characteristics. Deep or hardly visible stop. More than 4 missing premolars, including PM1 & PM2. Ears with rounded tips, overdeveloped ear-lobes. Over-angulated or straight in hindquarters. Narrow in hindquarters; knees or hocks turning out. Heavy, erratic movement or pacing. Long coat on the back-side of the forequarters and pronounced feathering on the back of thighs and the tail. Wavy, curly, soft or too long coat; coat parting in the middle on the back and the withers during shedding. Specks on the body which are not in the nuance of the main colour. Deviation from the size by more than +-2 cm. 4 or more missing teeth regardless, including PM1-PM2s or M3s, excess incisors. Too short or too long coat; no undercoat.